Thank you to all who joined us on February 7, 2019 for Hamilton artist Michael Allgoewer’s talk. A full house! Michael spoke about the body of work he produced for his exhibition 1514 and the enigmatic Albrecht Dürer engraving, Melencolia I, that inspired it all. A lively Q&A followed his talk. Michael Allgoewer’s exhibition 1514 includes nine recent sculptural and mixed media works. It is on view at the McMaster Museum of Art until March 16, 2019. Michael Allgoewer is a Hamilton-based artist. He was born in Montreal in 1954 and studied briefly at the Ontario College of Art in the mid 1980s. He has shown extensively in solo and group exhibitions, in both public and private galleries. 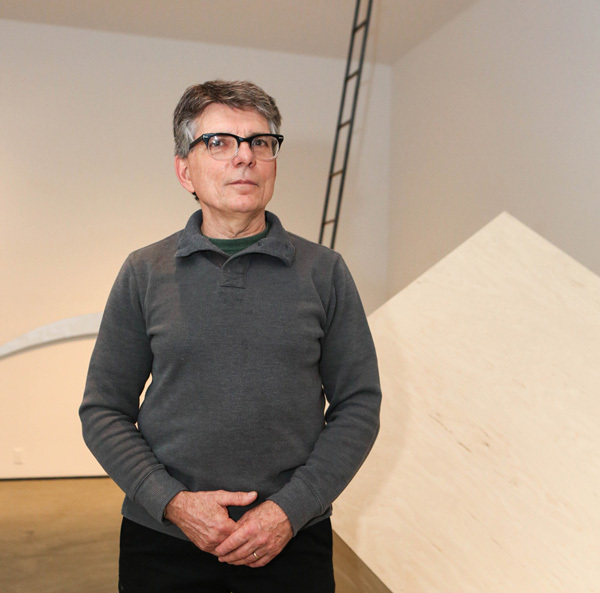 His work ranges from installation, emphasizing a connection with history and myth, often incorporating re-contextualized found material; to paintings which are abstract and rigorous in concept and execution. Michael Allgoewer is represented by b contemporary gallery in Hamilton, Ontario.